this neti pot is my spring time savior. For those unfamiliar with the neti pot, please allow me to introduce you to a technique that dates back centuries to the ancient Hindu practice of ayurveda (a system of traditional Eastern medicine). In sanskrit, the word Neti simply means “nasal cleansing”. Originally the idea was born out of the need to cleanse the nasal passages to allow air to flow more freely during yoga poses (asana) and meditation practice, but ‘jala-neti’ is now practiced around the world by yogis and allergy sufferers alike, with wonderful results. The idea is this: inside our nasal and sinus cavities are tiny, hair like structures called cilia that wave back and forth to push mucus towards the back of the throat where it can be swallowed, or to the nose to be blown out. The nasal passages are lined with a thin layer of mucus, which is one of our body’s most important and first lines of defense against illness. A nasal wash can help keep this layer of mucus moist, clean, and healthy, and can help flush out dirt, dust and pollen, and other bacteria-filled mucus before infection and discomfort can set in. There are many styles of neti, and plenty of pre-mixed saline solutions for purchase at health food stores, and all around the world wide web. It’s not necessary to spend a bunch of money on a pre-mixed salt solution when you can make your own at home by mixing non-iodized (VERY IMPORTANT) salt, and you can mix in a buffering agent (baking soda) to adjust the pH of the water. It is a MUST that you use distilled, sterile or previously boiled and cooled water. Our digestive track is able to contend with waterborne bacteria, but our nasal passages are not. In my experience, it seems to work better if you use luke warm to slightly hotter than luke warm water. Before I used this simple, spouted, spring-time savior I was totally averse to the idea of getting water up my nose, as often happens at the beach or in a pool. I still don’t take pleasure in the feeling, but I know that by using it in the morning when I get up, and again when I get home at the end of the day, I’m ensuring that I’ll use far fewer tissues and reduce my risk of spending the day sneezing by at least 75%. Boil and then cool to lukewarm enough water to fill your neti pot 3/4 of the way. Alternatively, you can use distilled or sterile water. Mix the teeniest pinch of non-iodized salt into a 3/4 full neti pot of water. You can experiment with the ratio of water to salt each time you prepare your solution. There should be just enough salt so that you feel it, but not so that it causes you discomfort. Some people add a pinch of baking soda to buffer the solution and make it gentler on the nose. You can also mix in various oils in very small quantities (or purchase a premixed neti wash booster), like goldenseal, peppermint oil, eucalyptus oil, or grapefruit seed extract. Every company that offers a pre-mixed product sings the praises of it, but states that the FDA hasn’t evaluated the effectiveness, and states that therefore there’s no real proof that they work. I’ve never mixed anything but salt into my water, but I’ve heard from numerous dedicated neti users that they love creating their own recipes, and change them as the seasons change. Once you’ve filled the neti pot, you’ll tilt your head over the sink at about a 45-degree angle, place the spout into your top nostril, open your mouth and begin breathing through it, as you gently pour the saline solution in and feel it flow out the bottom nostril. It wasn’t until I used the neti pot that I experienced just how narrow my nose is. I mean, I always knew it was long and thin, but when I tried this I thought: I must have the skinniest nasal passages in the world, with a seriously deviated septum as my process looks nothing like the ones I found in videos online, where the water flows out the bottom nostril like a turned on faucet. My doctor assured me there’s no cause for alarm, and that even if I only get a little amount to flow out, it’s beneficial. 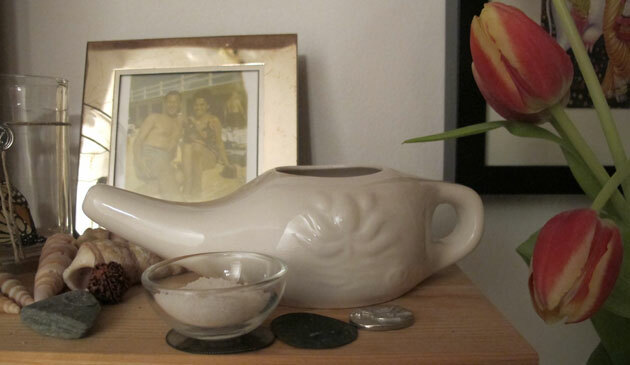 The good news is that neti pots are inexpensive ($8-$20), so even if you get one and you don’t like it, it’s not a huge investment, and since it’s small, you can store it and perhaps revisit it in the years to come. Until then, if you suffer from allergies like I did, a good concealer (to camouflage the dark under eye circles and irritated nose) and some waterproof eye makeup is your best bet. p.s. the gorgeous and very tanned couple in the picture are my grandparents, Miriam and Edwin, sunning themselves at the Jersey Shore back in 1964.